​Built in varying sizes, freestanding wardrobes known as armoires first appeared in France at the turn of the seventeenth century and were used in both domestic settings and in churches, often for storage of religious vestments. ​The distinctive diamond- or lozenge-shaped motif, inherited from French Mannerist forms, are frequently seen on Canadian pieces like the large examples above and right made from pine. These contain rows of interior shelving, with the monumental seven-foot armoire above distinguished by a single exterior drawer below the doors for additional storage. The green painted armoire at right stands just above six feet in height. ​Most French colonial homes contained at least one wooden chest or case piece in which to store valuables including textiles, clothing, precious metals, and other items. An abundance of specialized forms including armoires, commodes, buffets, cupboards, and other chests and cabinets could be found in these households, where they fulfilled utilitarian needs in addition to more aesthetic functions. The 1733 estate of Philippe Peiré, bourgeois of Québec living in the rue du Cul-de-Sac, contained a number of case pieces, including a veneered four-door armoire, a two-door cherry buffet, a two-door armoire, and a maple commode fitted with two full-width drawers, two half-width drawers, and embellished with copper mounts and hardware. A likely holdover from the preceding century, the merchant-judge and seigneur François-Marie Bouat of Montréal owned a walnut cabinet set on a stand of twisting columns and appraised 50 livres in 1724. Armoires could also be more contemporary in design, deriving inspiration from metropolitan French prototypes produced in Atlantic port cities like Bordeaux and Nantes. These case pieces often adapted rococo ornaments like small cabriole legs terminating in pieds de biche or French scroll feet. The example at right was found in New Orleans. Its exotic hardwood construction suggests origins in the French West Indies, possibly in Guadeloupe, Martinique, or Saint-Domingue, but it could just as easily have been made in Louisiana by a craftsman with a supply of such woods. ​Geometric ornament can be observed on an armoire found at the Jarrot Mansion in Cahokia, Illinois, and possibly made in the Upper Mississippi Valley. Seen at left, this piece is unfortunately missing its cornice, but bears witness to the continued popularity of older styles in French colonial America. Like many French Canadian pieces, it might perhaps have been painted. ​As previously noted, many armoires from this part of the French Atlantic world are distinguished by their incorporation of highly figured tropical hardwoods that also found favor in metropolitan French cabinetmaking. A third example seen at right combines amaranth and mahogany and is similar to Martinique armoires in construction and design. The striking grain of the tropical hardwood is most readily apparent in the lower portion of this piece's shaped paneled doors. Although these three armoires stand just over six feet, smaller versions of the same form can also be documented, including diminutive models. Made from walnut, the petite armoire below measures just over four and a half feet in height. ​The Winterthur armoire's discovery in New Orleans underscores the city's identity as a point of French colonial acculturation. Stylistically, it and a similar armoire seen at left are colonial interpretations of metropolitan French design. In contrast to the geometric form of the Canadian pine armoires seen above, these case pieces adopt curving, sinuous lines seen in the scrolled beading of the scalloped skirt and on the doors. Recalling carved interior paneling or boiserie, their recessed cartouche door panels feature early if not original brass "seahorse" escutcheons. The body or case rests on French scroll or cabriole feet with small pyramidal supports. ​Like armoires, buffets for storage of linens like napkins and tablecloths, eating utensils, ceramics, and other tablewares could also be made in varying sizes. These ranged from simple low case pieces referred to as buffet bas, to larger tiered forms, like the buffet à trois corps. Freestanding dressers or vaisseliers, which evolved from earlier forms known as dressoirs, might also be used for dual storage and display. French Mannerist and rococo style armoires, buffets, and other case pieces continued to be made in Canada and Louisiana well into the nineteenth century. Metal mounts and fittings were often used to embellish commodes, or chests-of-drawers, and the flat wooden surface of these pieces or removable marble tops could be used for the decorative display of clocks, ceramics, and other objects. 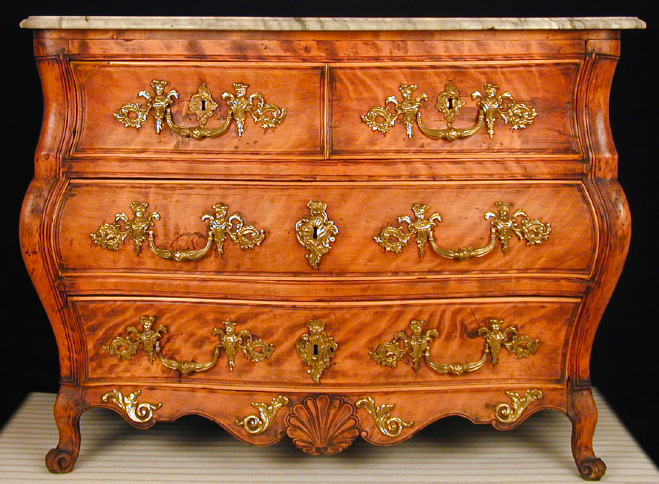 A cherry commode owned by Madame Sarrazin, a physician's wife in Québec, was outfitted with copper mounts in 1743. It featured one large drawer and four smaller lockable ones. Set atop this commode was a smaller locking chest or cabinet, an intriguing reference to how multiple pieces of furniture might be used together. The slightly later example seen below to the left has a Montréal provenance and would have likely been used to store textiles. In comparison, a second commode seen at right has an altogether more illustrious history. Owned by the last bishop of New France, Henri-Marie du Breil de Pontbriand, this European walnut chest of drawers was almost certainly made in or around Bordeaux. Its bombé shape and arched feet are characteristic of the work of furniture craftsmen working in western French ports, specifically Bordeaux, in the mid-eighteenth century. Monseigneur de Pontbriand had business dealings with a mercantile family there, as did other wealthy colonists. The commode and its marble top were among the bishop’s furnishings inventoried in Montréal in 1760 and subsequently given to the Sulpician Order of that city. The handle bales on Monseigneur de Pontbriand's commode have been stamped with a crowned letter C, indicating that they could not have arrived in Canada before 1745 at the earliest. Between 1745 and 1749, a royal decree levied a tax on bronze and copper products; the stamp proved that the tax had indeed been paid on the commode's escutcheons, handles, and other ornamental hardware. Arriving in Canada in 1741, the bishop likely ordered this commode from France between 1745 and 1760. As a major Atlantic port, Louisbourg witnessed the arrival of an important amount of non-French furnishings, sometimes through illicit inter-colonial trade. The 1741 inventory of Marie-Suzanne Basannière, the widow of Claude Joseph, notary of the colony of Île Royale, reveals the presence of a large "English commode" equipped with three large drawers and four small ones, along with six "English" chairs covered in red leather in the chambre of her Louisbourg home. Another chamber contained twelve chairs à l'anglaise. Such descriptions of British or Anglo-colonial furniture are not uncommon in French colonial records, a testament to the transnational nature of artistic style in New France that does not appear to have been adopted in New England. The chest-of-drawers seen at right provides an interesting "Anglophone" counterpoint to the Gallic models seen above. It could very well match the one described in the Bassanière inventory. 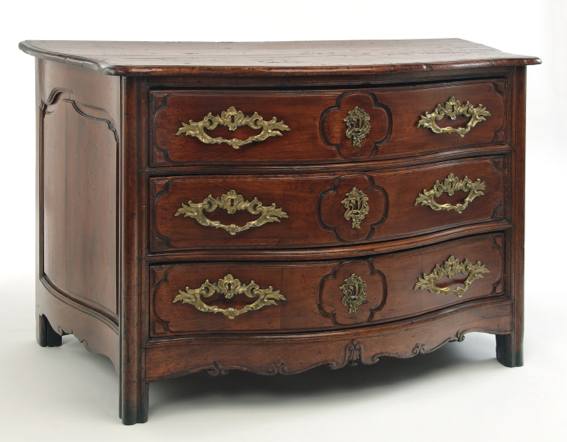 Made in Boston, chests of this sort were first made in the fourth quarter of the seventeenth century. On the basis of its style, it appears to derive from models made in the Boston shops founded by cabinetmakers Ralph Mason, Henry Messinger, and Thomas Edsall. The chest was probably made after 1690 and inventoried in the Boston home of John Pierce in 1744. It could just as easily have left Boston for a port like Louisbourg, perhaps after being judged too out of fashion. These French copper alloy mounts were excavated at three different sites within the Fortress of Louisbourg. They date stylistically to the period between roughly 1720 and 1740 and would have adorned stylish commodes possibly owned by the commissaire-ordonnateur of Louisbourg and the merchant François Cressonnet. Storage furniture of the best sort featured this sort of metallic embellishment, and the governor-general's château Saint-Louis in Québec boasted actual gilt bronze, or ormolu, furnishings. Coincidentally, these pieces match the hardware currently seen on Monseigneur de Pontbriand's commode, seen above.